My iPhone premium unlock did not work!!!! Hi, I purchased the Premium upgrade for the iPhone version and it does not seem to have worked. I still get the oxygen warning, telling me i have to buy some or wait until tomorrow to keep playing. I have an iTunes receipt showing the $9.99 purchase. What do I need to do? I still see the PREMIUM button on the start screen, but I'm scared to hit it now, lest I be charged again. as you can see, it knows I have bought it, but it never downloads the premium unlock. HELP ME PLEASE!!! 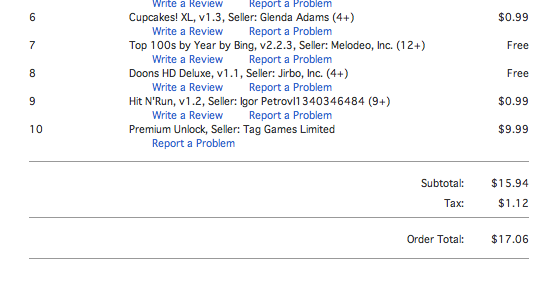 Unlike you I actually have clicked the buy button again and again at least 50 times... Still nothing. They were quick to take my $10 but it's been over a week of email complaints, messageboard complaints, iTunes complaints demanding them to fix it or refund me and all I got was an email from tag telling me that the new update would fix the problem. They told me wait for the update this week and the bug will be fixed. Still doesn't work... Now I'm just mad. Give us our money back!!! Re: My iPhone premium unlock did not work!!!! the update actually started working for me yesterday. not sure if it's dues to an update or to them getting one of my 4 e-mails, but whatever, it started working, so I'm cool.